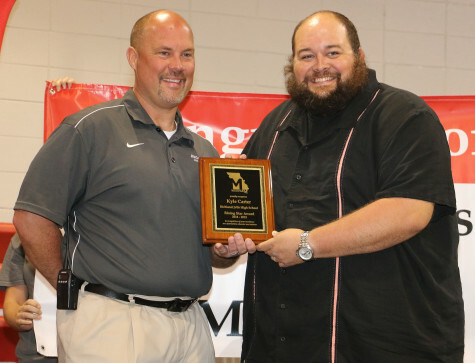 2015 MJEA Rising Star Award Winner – Missouri JEA. Kyle Carter from Richland R-1 Schools has been named the Missouri Journalism Education Association’s Rising Star Award winner. For the past two years, Carter has been teaching business and advising the yearbook. In his short time as an adviser, Carter has done big things for the program. An accomplished photographer himself (a Mississippi Press association award winner with photos published in USA Today and Sports Illustrated to name a few), his students have been recognized with a number of awards for their photography under his guidance. He was nominated by one of his students, Parker Miller. A junior in his first year on the yearbook staff. In his short time as a staff member, Miller is a Gold Key winner from Quill and Scroll, an MJEA Photo of the Year Finalist and a member of the 2015 MJEA All-State Journalism Team. The Richland Director of Music and Bands, Amber Dulley, said, “Our current yearbook and journalism program is only in its second year, and has made unprecedented advances in student involvement, student skill level, use of technology, and quality of product.